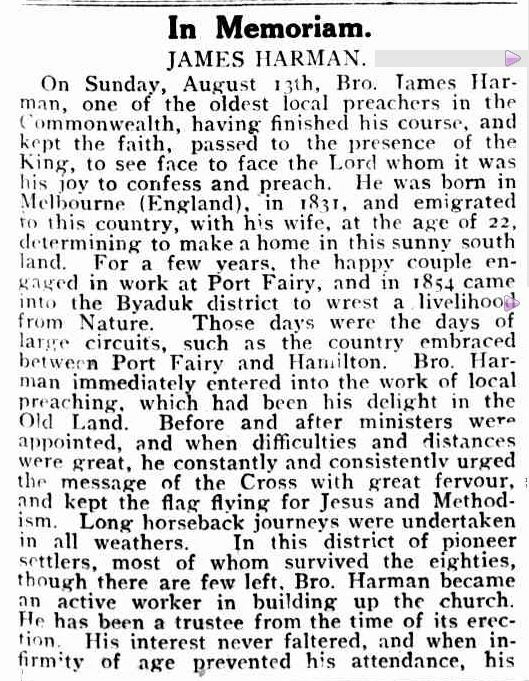 The following advertisement for the 1916 Hamilton Pastoral & Agriculture (P & A) Show reminded me it was the first Hamilton P & A show my ggg grandfather James Harman was not around for. In turn, it reminded me today is the 100th anniversary of James Harman’s death. “Advertising” Hamilton Spectator (Vic. : 1870 – 1918) 29 August 1916: 5. <http://nla.gov.au/nla.news-article133706580&gt;. James Harman’s roles with the P & A included exhibitor, judge and committee member. 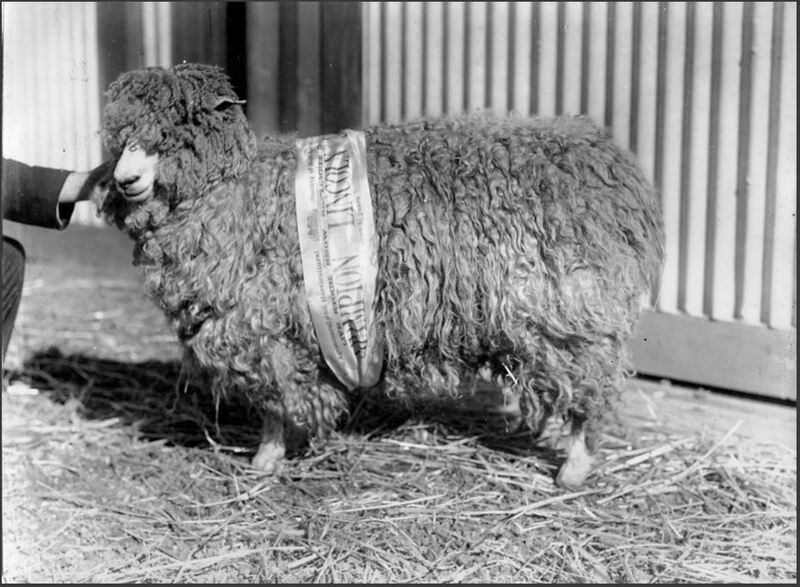 Over the years he exhibited Lincoln sheep, farm produce, and border collie dogs and judged produce and farm machinery. 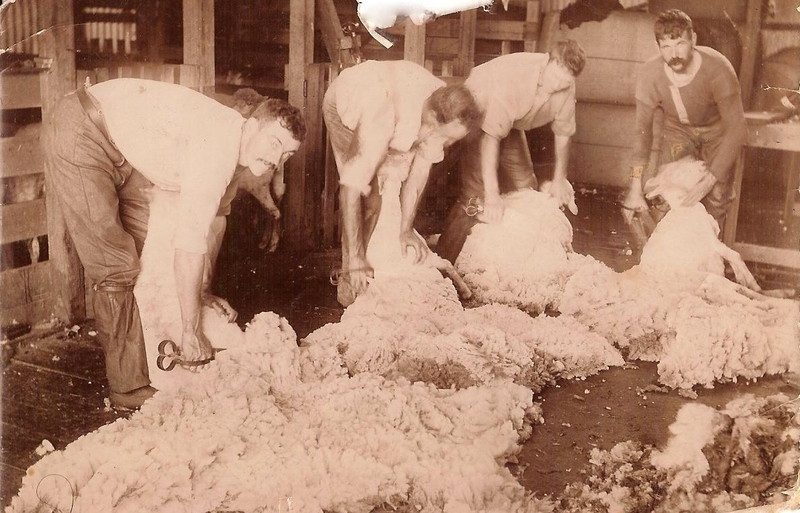 Toward the end of the 1870s, when his oldest boys could take on duties on his farm, James had more “leisure” time so he threw himself into a few local farm related activities and the P & A was one of those. 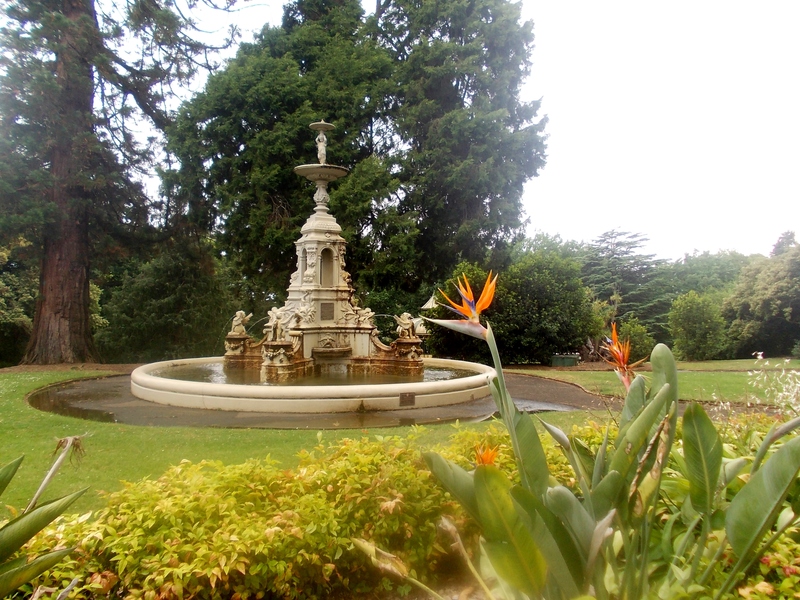 Respected by farmers and graziers alike, James could mix with all men including Hamilton Spectator owner George Rippon, grazier and politician John Thomson and businessmen Peter Learmonth, and Robert Stapylton Bree each prominent names in the annals of Hamilton and district. “PASTORAL AND AGRICULTURAL SOCIETY.” Hamilton Spectator (Vic. : 1870 – 1918) 17 May 1883: 4. . In 2011, I wrote The Leader of the Pack on the assumption if all my ancestors came together at one place and time it would be James Harman who would step to the front and lead the group. Five years on and knowing so much more about James, I have no doubt. At first I formed my opinion on his place in the Harman family as eldest son and his place in the community as a Wesleyan Methodist Church Local Preacher. Now, with more issues of the Hamilton Spectator at Trove now giving me 248 tagged articles for James, I know his leadership went beyond the confines of family and the Byaduk community. 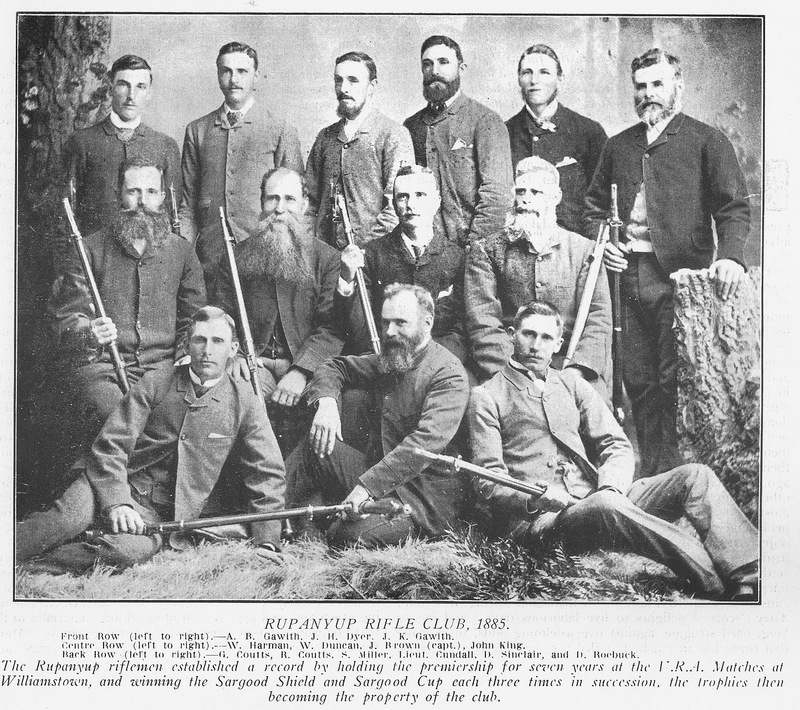 Along with James’ P & A involvement, he was on several occasions President of the Hamilton Farmers Union in the 1880s and the founding president of the Byaduk Farmers Club. 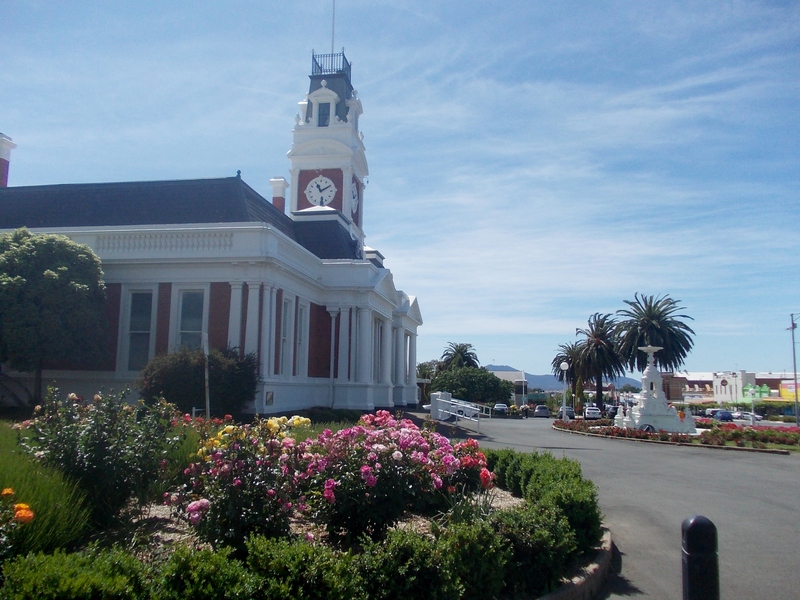 He also was on the Byaduk State School committee, represented the Byaduk community at Dundas Shire meetings and as a leader in the church, attended Wesleyan Methodist Synods representing the Hamilton circuit, always considering the interests of the local church goers. 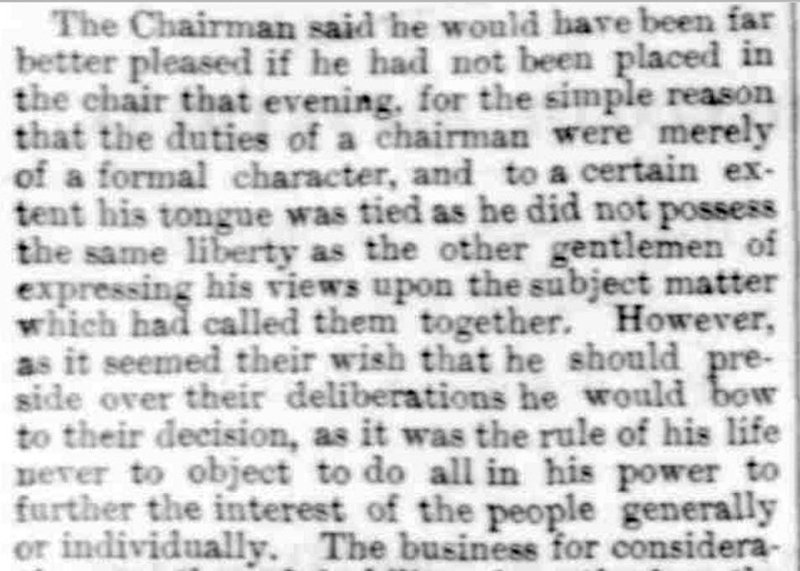 Throughout, James remained humble and during his Farmers’ Union presidency considered he was not worthy of leading the organisation. But James also said if he joined a committee he gave it everything he had and he was true to his word. 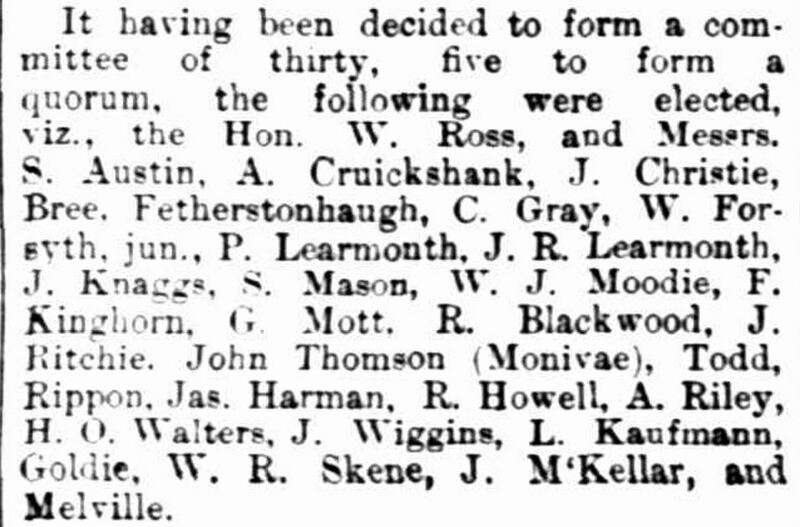 James’ election to chairman of a meeting in 1881 to discuss a possible extension of the railway from Hamilton to Byaduk was just one occasion when James expressed those sentiments publicly. “RAILWAY MEETING AT BYADUK.” Hamilton Spectator (Vic. 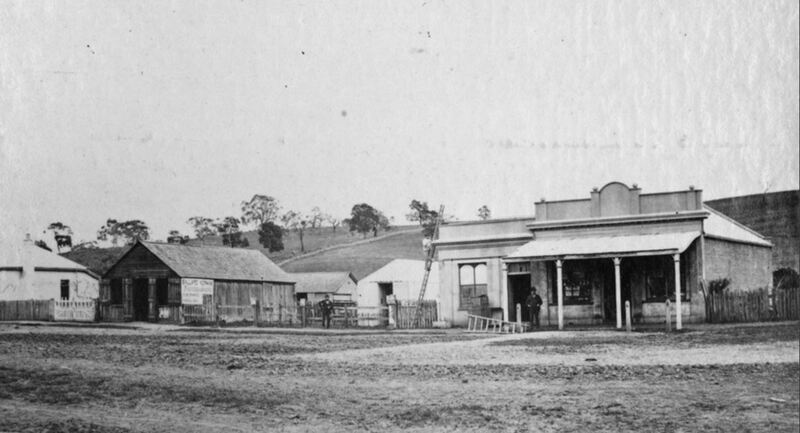 : 1870 – 1918) 15 October 1881: <http://nla.gov.au/nla.news-article226062215&gt;. 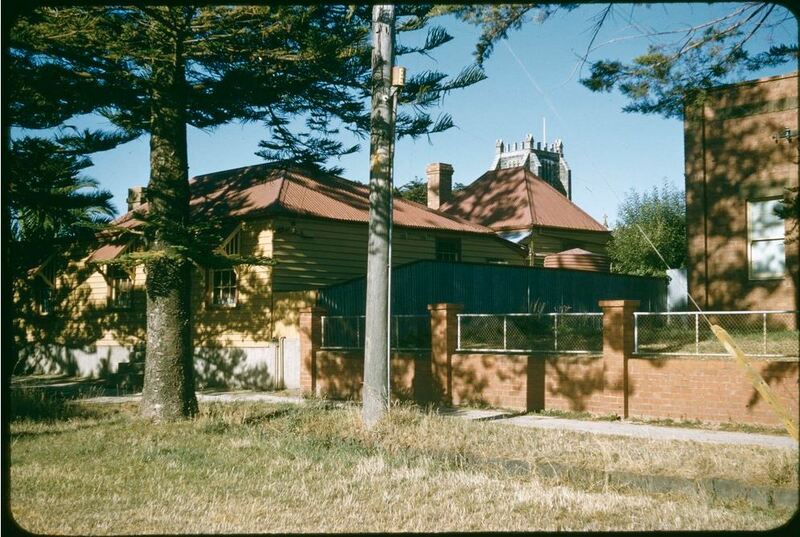 Trove is great for finding photos and it was the Trove picture search I headed to recently looking for the home of George Hall Harman and his wife Rebecca Graham formally of James Street, Port Fairy. 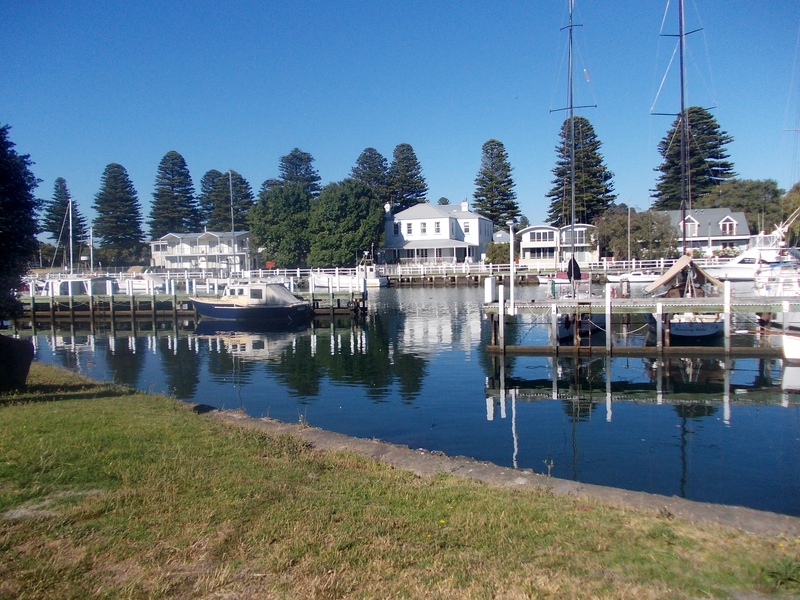 I knew the house no longer existed and with the help of a family history written by George and Rebecca’s granddaughter Edna Harman, I thought I had roughly found the location of the house while visiting Port Fairy in January 2014. During the past year, more information was forthcoming when Mike Harman contacted me. Mike is my Nana Linda Hadden’s first cousin, both grandchildren of Reuben James Harman, a nephew of George Hall Harman. Mike passed on some of the work his sister Joan had done on the history of the Harmans and the information about George Hall Harman, caught my eye. 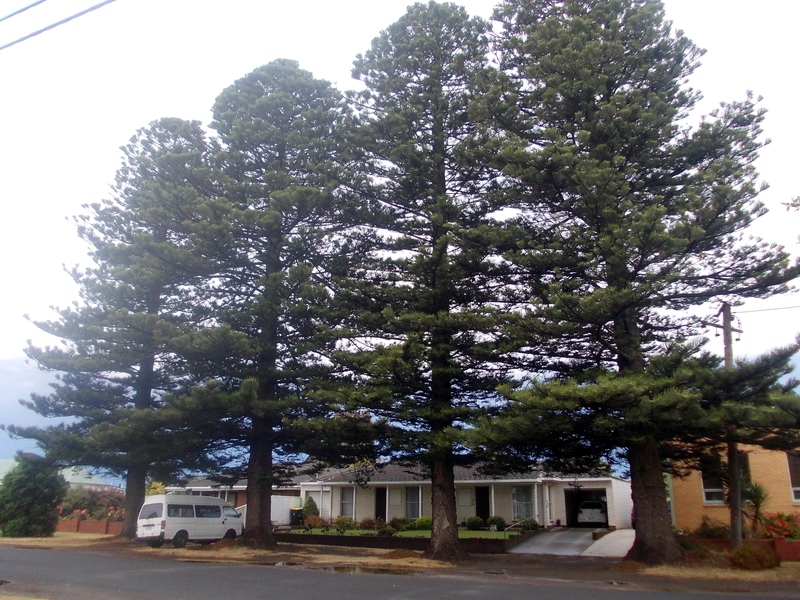 Apparently, when Rebecca passed away in 1902, grieving George planted four Norfolk Pines in front of their home in James Street. 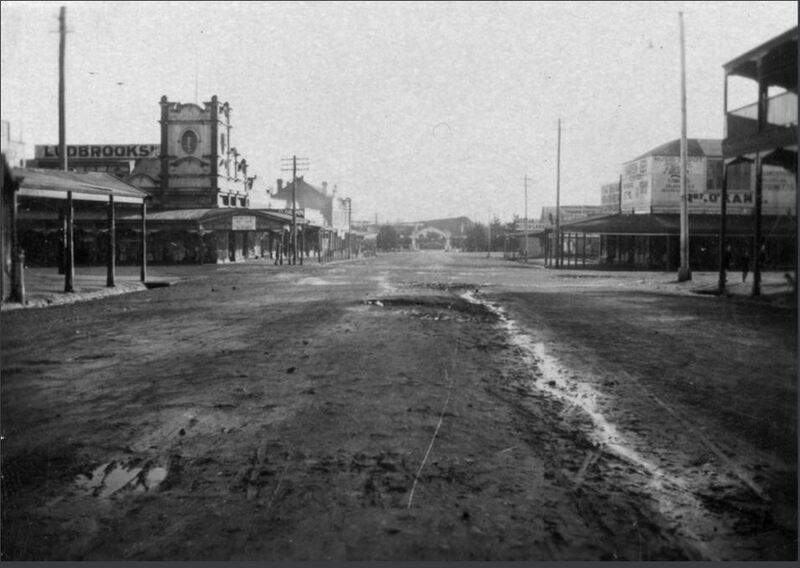 Once home, I went in search of an old photo of James Street. The State Library of Victoria’s (SLV) collection was the likely place to find one but instead of searching directly at the SLV site, I chose Trove, my preferred ‘search engine’. I seem to get better results when I search Trove, I like the filters that aid the search and I can tag my results or had them to one of my many lists. 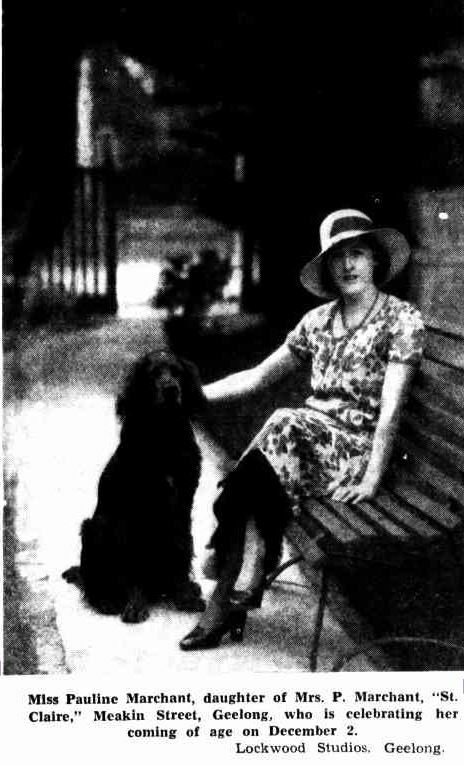 I searched for “James Street Port Fairy” and toward the top of the search results was a photo from the Lilian Isobel Powling collection at the SLV. It was of James Street from 1958 and it gave me more than I expected. The photo was looking right at the house that once stood behind the pines, presumably that of George and Rebecca Harman. The top of St. John’s Anglican Church is visible in the background. 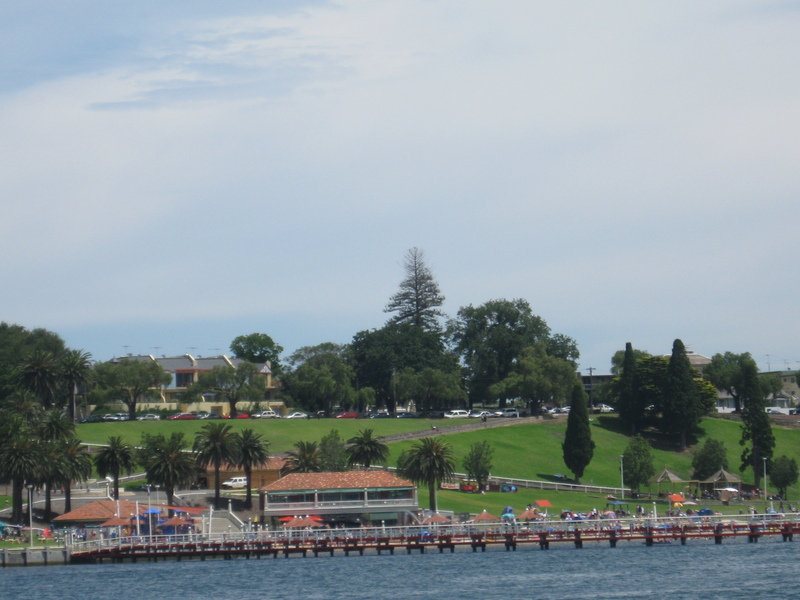 I did take a photo from a similar angle to the 1958 version but a little further back. 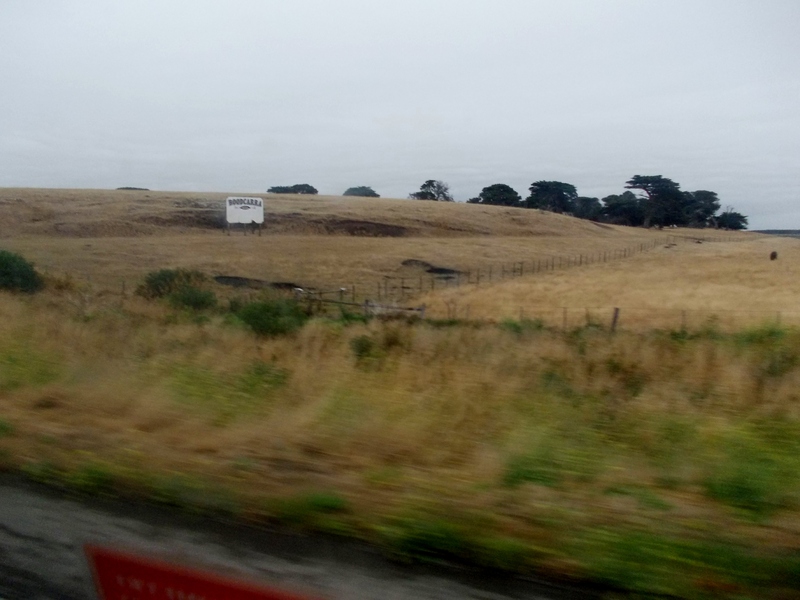 Although it is hard to see, the top of the church is now obscured by pines and an electricity pole stands in the same spot as 1958. 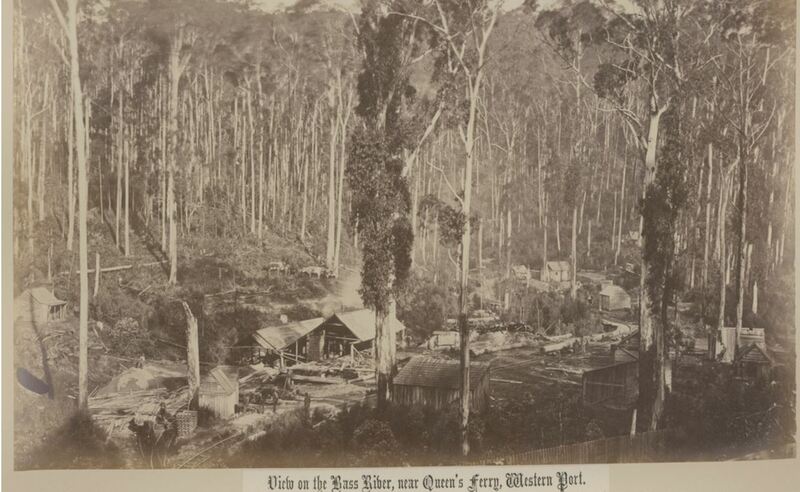 Recently on the Victoria Genealogy Facebook group’s feed, there was a discussion about family stories becoming family “fact” so I would like to make sure Rebecca’s trees are more than a family story. 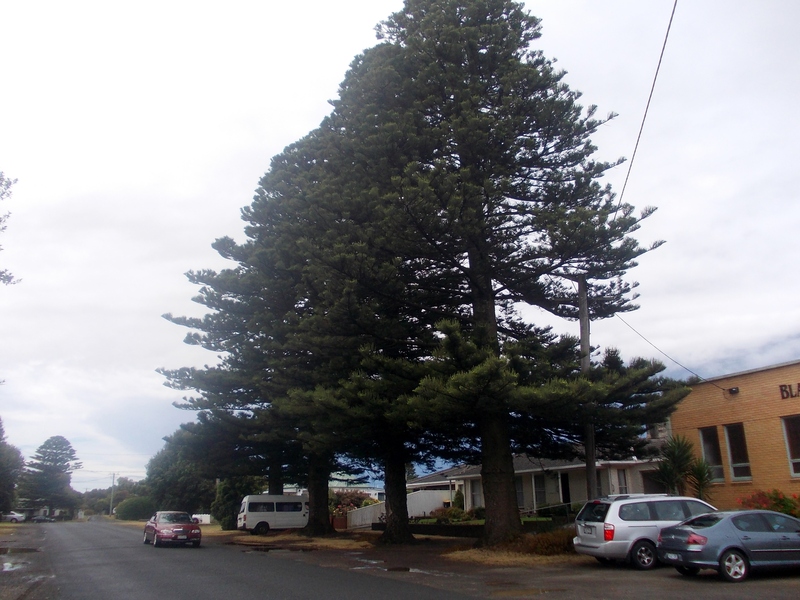 I have a lot of Harman information from the Port Fairy Historical Society, but there is no information about the trees. 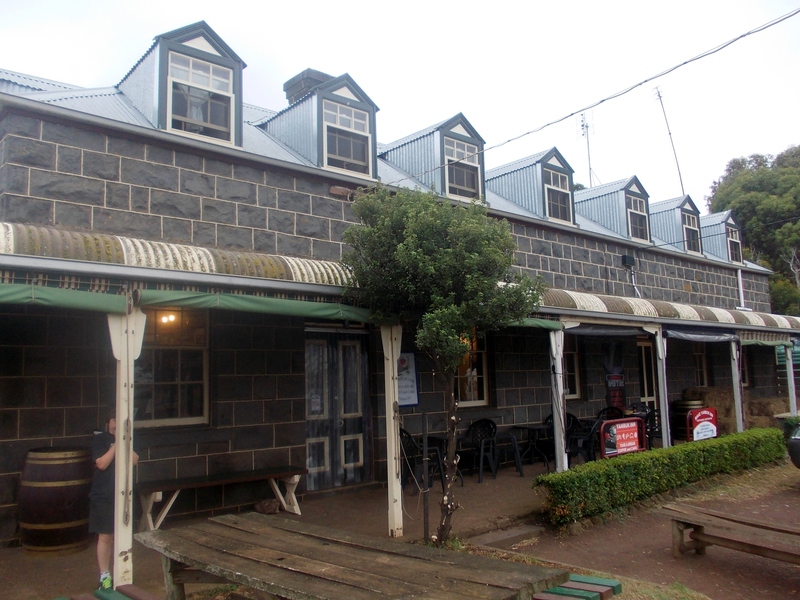 The Port Fairy Gazette is a possibility, but my first step will be to confirm exactly where the Harman’s lived in James Street. However, I’m a little “Harmaned out” at the moment and would like to focus on some of my tree’s other branches, so in-depth research will have to wait for now. While writing the history of the Harmans of Byaduk, I immersed myself in the family’s daily lives and at times felt as though I was there with them. 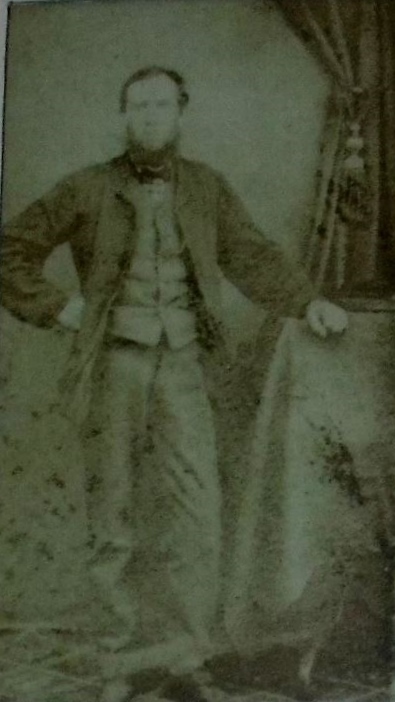 With my ggg grandfather James Harman, I was among the congregation at the Byaduk Methodist Church and traversed the countryside as he conducted his Local Preacher duties. I attended sheep and Pastoral and Agriculture (P&A) shows and learnt the finer points of tilling the soil at ploughing matches. 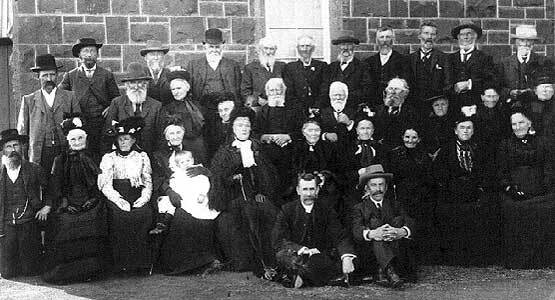 I felt James’ pride in 1907 as he stood with his fellow pioneers and friends for a photograph before his beloved Byaduk Methodist Church (below) and shared his satisfaction when he won a Lincoln ram at the Hamilton P&A show. BYADUK PIONEER DAY – March 27, 1907. JAMES HARMAN (Back Row, 6th from right), JONATHAN HARMAN (Back Row, 5th from right), ELIZABETH OLIVER, widow of REUBEN HARMAN (Front row, 2nd from right). 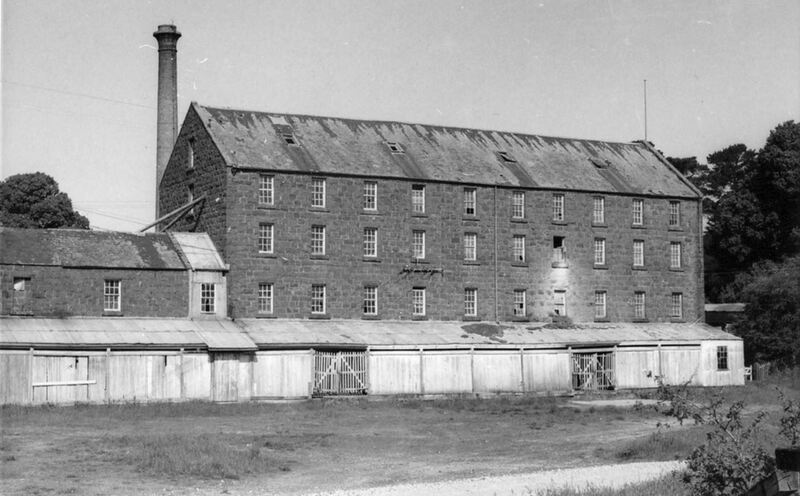 Photo courtesy of the Hamilton History Centre. 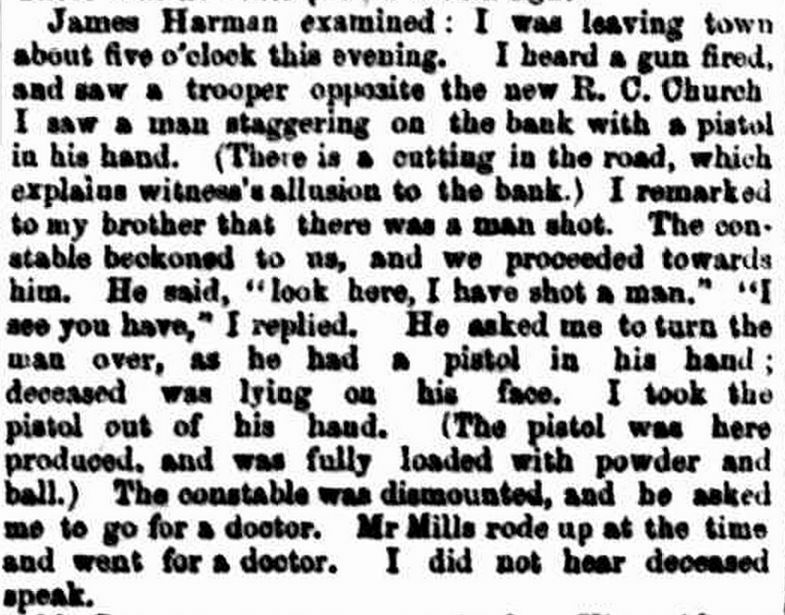 The post False Alarm, revealed my ongoing frustration of not having an obituary written about James Harman, my favourite ancestor. One such as those written for his brothers Jonathan and Walt, lengthy, information-packed tributes which told me much about the type of men they were. An obituary for James in the Hamilton Spectator came close but I wanted more. 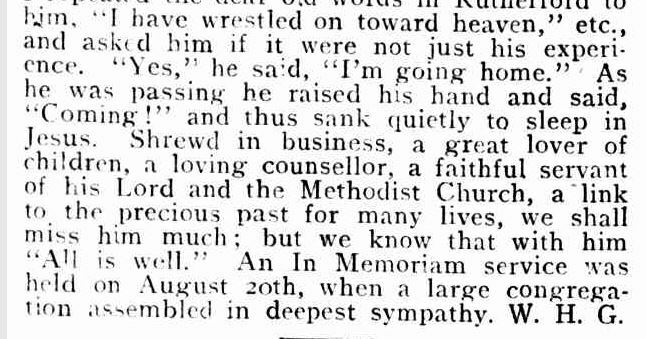 Just a few weeks before my thesis was due, the Spectator and Methodist Chronicle (Melbourne 1914-1918) came online at Trove and there was an obituary for James. Unfortunately, the article was still undergoing quality control checks so the wait was on. My “Electronic Friend” would send an email when the article was ready to go but no amount of checking my inbox made the article arrive. The submission date for my thesis came and went and still, the article was unavailable. Until yesterday. The obituary was signed “W.H.G” and knowing something of the Byaduk Methodist Church helped me name the author as the Reverend William Herbert Guard who presided over the church at the time of James’ death. His tribute answered one of my questions about James. When did he become involved with the Wesleyan Methodist Church? 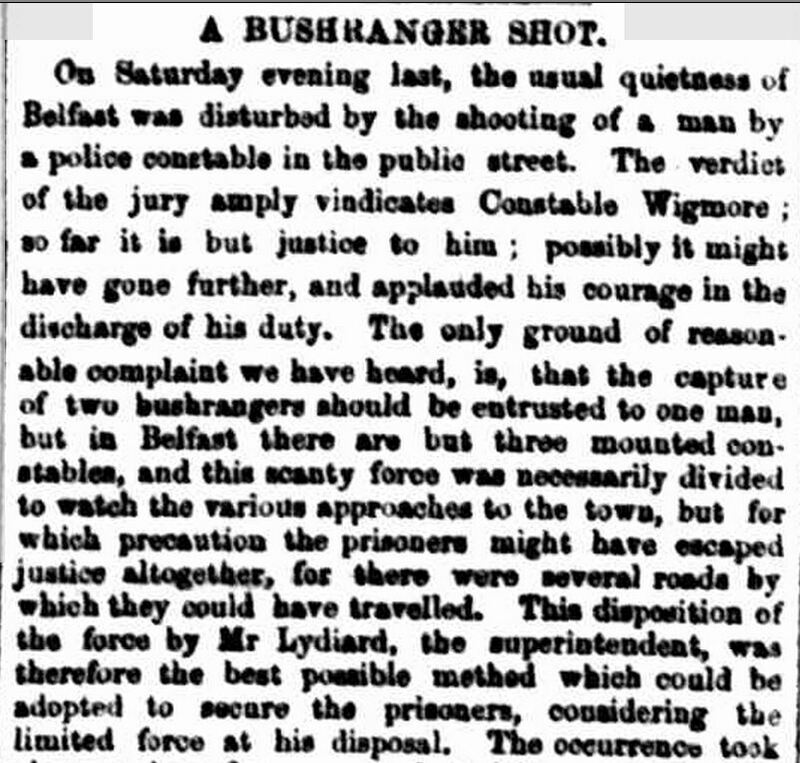 Was it when he arrived in Port Fairy in 1852? 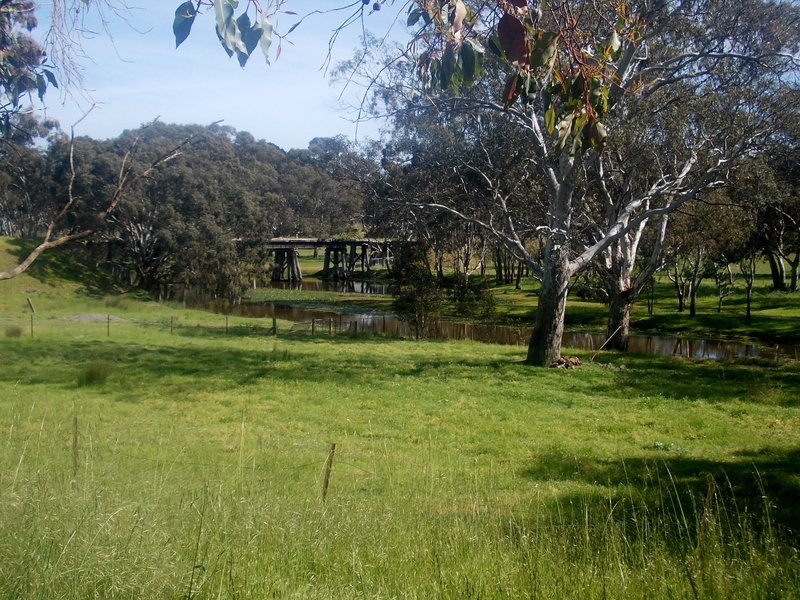 Or when the family spent some time at Muddy Creek before going to Byaduk. 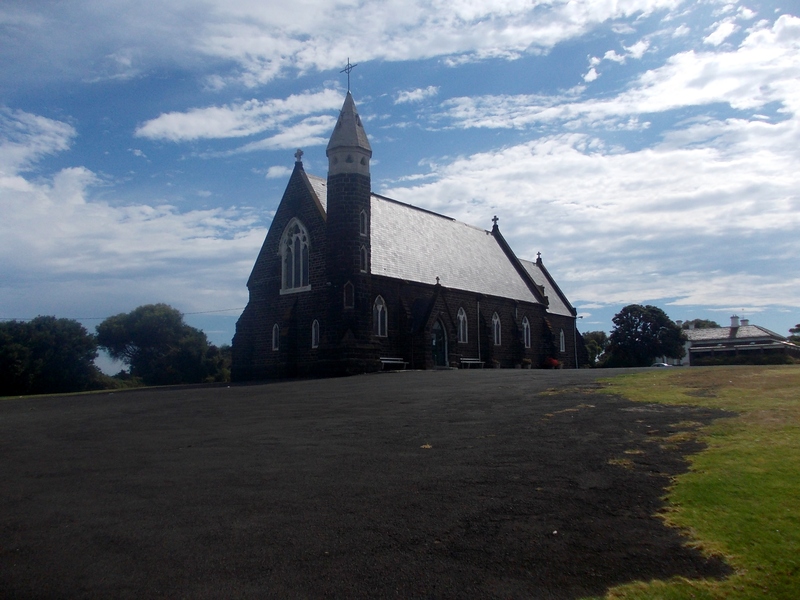 Muddy Creek had a strong Methodist community of Wesleyans, Primitives and Reformers who had arrived via Port Fairy. But, according to Reverend Guard, James’ commitment to Methodism began before leaving Cambridgeshire. Reverend Guard visited James in his last days and recounted those visits but most powerful were his recollections of James’ final hours. “I’m going home,” a weakening James told him. Then in his last moments, James raised his hand and uttered his last word “Coming” and with that, he was gone. James was ready to meet his God. Many obituaries describe the last moments of a person’s life but often in a clinical fashion. W.H.G.’s description was spiritual. Such was James’ devotion it couldn’t be any other way. James was not just “going home” to God. His beliefs gave him the faith to believe he was also joining his wife Susan Reed. The obituary confirmed the bond he shared with Susan, forged over sixty-four years. 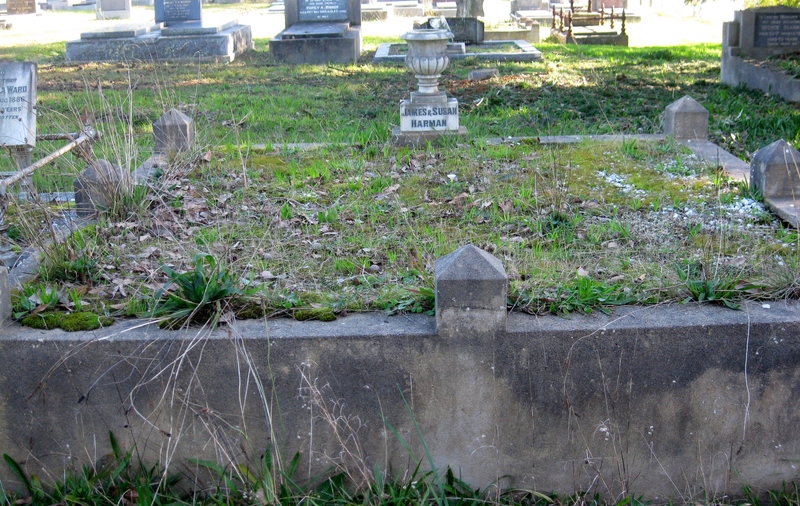 Susan died on 10 April 1916 and James on 13 August in the same year. I have always thought the few months apart was too long a time for James. 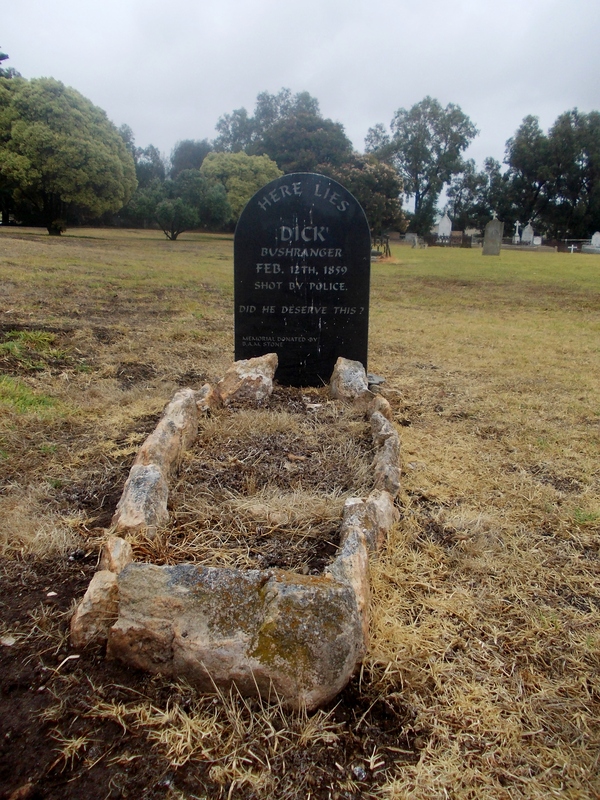 He had lost the woman who gave him strength and after only four months they were reunited at the Byaduk Cemetery. There is little information about Susan’s life besides her birth, death and children in-between. But she was with James when they left Melbourn, Cambridgeshire as newlyweds and endured a forgettable voyage on the Duke of Richmond. 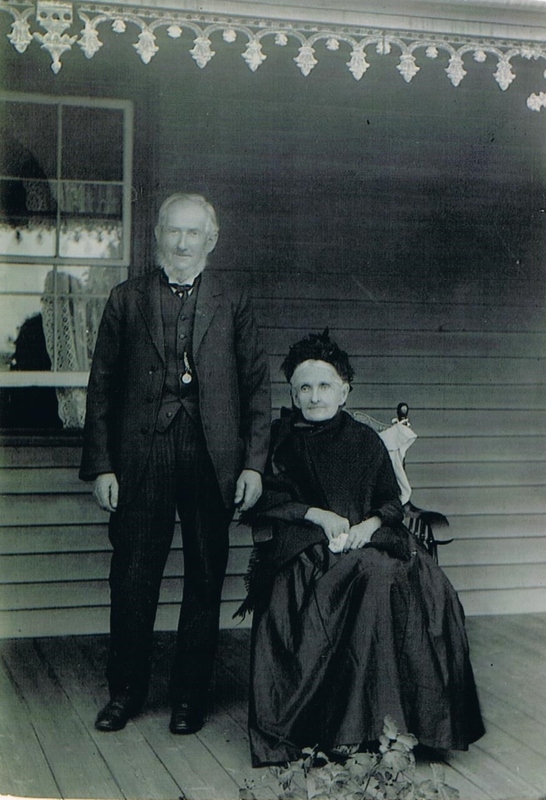 She travelled with him from the port of Portland to Port Fairy for James’ first employment in Victoria and together they endured the pioneering life at Byaduk. No doubt she sat up late into the night waiting for James to return from church meetings and sheep shows in neighbouring towns. Reverend Guard brought to my attention something about Susan I did not know and it was sad to read of her blindness in her last years. That is now obvious when I look at her in this treasured photo passed on to me by James and Susan’s great-grandson Mike Harman. JAMES & SUSAN HARMAN. Photo courtesy of Mike Harman & family. On reaching the end of Reverend Guard’s tribute, chills had come over me and tears filled my eyes. Since that first reading, I have thought often of those last hours of James’ life with sadness. After feeling many emotions while researching James’ life, for the first time, I was feeling grief. It is the only time I have felt that emotion about my long departed ancestors. Usually, such discoveries evoke feelings of jubilation such as the revelation my ggg Grandmother Ellen Barry died in a house fire caused by her insobriety or learning my gg aunt Ellen Harman dropped dead on the floor while cooking breakfast for her son. While I did feel sad for their unfortunate passing, always in the back of my mind was the thought “That will be good for the family history”. But the tears that came to my eyes when reading about James weren’t because this useful information missed my thesis, it was because I felt like I was saying goodbye. Snapping back to reality, I reminded myself the never-ending journey of family history will bring new stories of James and I can once again join him on his life’s adventures. 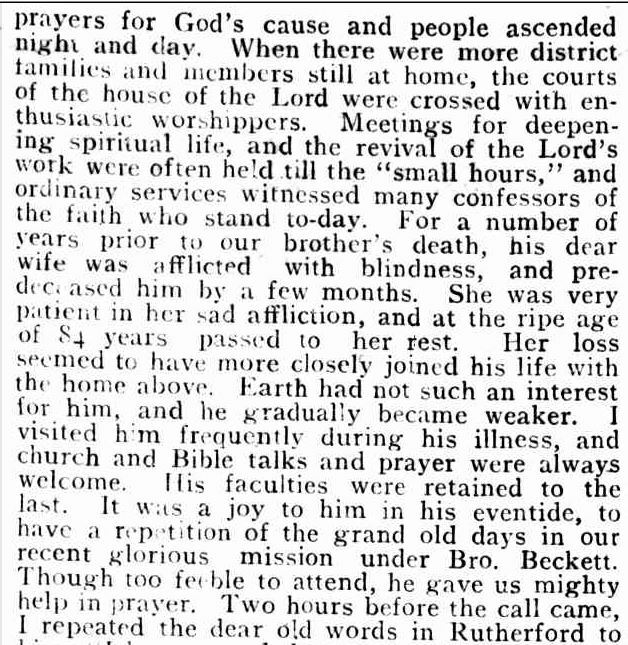 “In Memoriam.” Spectator and Methodist Chronicle (Melbourne, Vic. : 1914 – 1918) 11 Oct 1916: <http://nla.gov.au/nla.news-article154270437&gt;.